The Factory Girls directed by Iris Keogh & Marie C. McCourt will run in The Mermaid Arts Centre Bray from Tuesday April 2nd to Saturday April 6th. 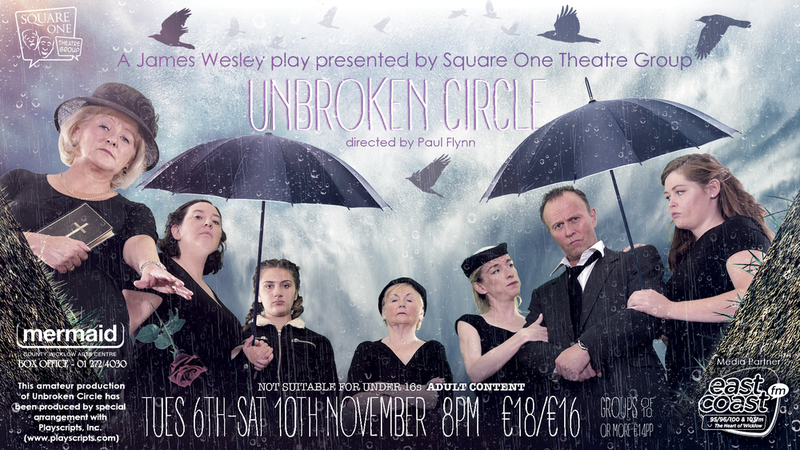 Unbroken Circle directed by Paul Flynn will run in The Mermaid Arts Centre Bray from Tuesday November 6th to Saturday November 10th. A new play, recently premiered on Broadway, has received terrific critic acclaim with the author being hailed as a modern day Arthur Miller. Set in 1970 Galveston, Texas, a family is brought together for the first time in years on the day of it's patriarch's funeral. As the day turns into night, the impact of the man on his family, unfolds in surprising ways leaving each member grappling with the truth. It is hilarious and disturbing as it explores how family secrets affect every person in each generation differently. Inspired by a true story, it's content is not suitable for under 16's and may offend. It's 1909. Three couples celebrating their silver anniversary discover that they weren’t actually married. Shock and panic ensue. Journalists, a drunk photographer, a blackmailing housekeeper and a barmaid with designs on all the men, add to the confusion and laughter – a fun comedy. Square One is performing Eulogy written and directed by Byron Hayes at the Bray One-Act Festival on Friday night, January 27th, in the Mermaid Theatre in Bray. A drama directed by Byron Hayes and staring Conor Waldron, Lydia Hayes, Sinéad Loftus, Byron Hayes, Sean Farrell and Callum Van den Bergh. 40 Years of Tremendous Theatre! Square One Theatre Group is proud to announce that 2016 is its 40th anniversary! To celebrate, we will be holding a ball in the Summertime, with good music, great people, and some fantastic memories – both old and new! Square One Theatre Group is celebrating it's 40th Anniversary this year, and to celebrate we're staging one of our most ambitious productions yet this April – Pride & Prejudice. Based on Jane Austen’s classic novel highlighting the mannerisms, traditions, courtships, and relationships of 1800s England, this is the tale of one of the most famous courtships in history. This November, award-winning local author David Butler is turning his hand to directing at the Mermaid Theatre, and has chosen Brian Friel’s wonderful character-piece, Aristocrats (1979), for the occasion. Square One's entry to 2013's Bray One-Act Theatre Festival is The London Vertigo by Brian Friel, directed by Caroline Hill. Square One Theatre Group's next production is the classic whodunnit by Agatha Christie, And Then There Were None, nightly at 8PM from Tuesday 17th - Saturday 21st April 2012. Square One is performing The Revenge of the Red Feather Ladies by Maxine Holmgrem at the Bray One-Act Festival on Friday night, January 27th, in the Mermaid Theatre in Bray.